After seven hours spent reading John Steinbeck’s very average Cannery Row and intermittently staring out the window at the rolling English countryside, the train I rode on eventually trundled its way into Cheltenham Spa station. As is came to a hissing stop I lugged my golf clubs onto the platform, navigated my way through the ticket barrier, and entered the car park to be flooded by the baking south-west sun and the sight of two very familiar faces. Seventeen months had passed since best friends and travelling companions George and Aaron had bid their farewells to me in Queenstown, but save a few additional stereotypical traveller tattoos their time spent bartending in Australia seemed to have treated them well. Our bromance had been forged over a month-long period circumnavigating New Zealand on a hop-on-hop-off party bus and served as the primary artery running through the pages of my third published paperback Kiwi, Kiwi. Such was the depth of our flashpacking relationship, we’d kept in frequent touch throughout our respective jaunts through Oceania, South-East Asia, Europe and back to the island we all called home. George had been going on an annual team golf holiday for the previous six years, and as the event rolled around for its ninth showcase he’d asked if Aaron, myself, and their mutual friend Greg would like to be new recruits for the 12-man Celts team aiming to end a slew of English victories that stretched back for half a decade. 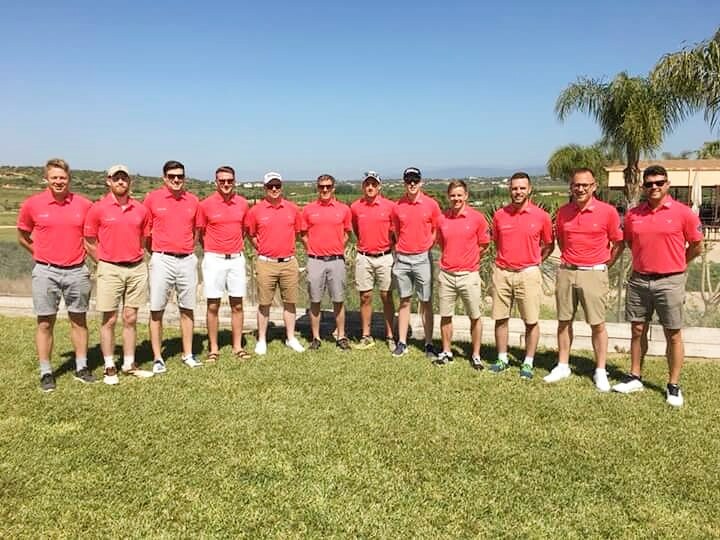 Having started out as a lads’ weekend getaway the event had since grown arms and legs, with the forthcoming edition set to pit the two opposing teams against one another in a four-day Ryder Cup-style format on a pair of resort courses in Albufeira, Portugal. George had billed it as ‘the hardest four days of golf and drinking in the calendar year’ and I’d accepted and paid my deposit in a flash. Absolutely ravenous following my journey down from Glasgow, I was delighted to hear that Aaron’s Grandpa had put on a barbecue for the whole family and that the invite had been extended out to myself. He had been born and raised in the Welsh valleys, hence Aaron’s link to the Celts team, and as I munched down a succulent burger and slugged on a bottle of beer he told me about his time spent bringing electricity to the Scottish isles, having seen Jonah Lomu make his international rugby debut for New Zealand as a teenager at the Hong Kong 7s, and asked questions about what my time on the road had been like in the company of his grandson. A truly humble and fascinating man. A brief stop at the shops to stock up on sun cream also saw Aaron purchase the tightest pair of shorts alive (or so I thought…), before we went for a stroll around the Spa’s beautiful city centre where a jazz festival had been taking place that previous weekend. As the sun began to set and a chilly breeze blew through the air we then headed up to George's estate; the electric gates opening to a sweeping driveway that made the house on the hill look like a cross between a mafia hangout and the set of a rap music video. With our flight leaving from Gatwick at 6am the following morning, and a two hour drive to the airport standing in the way, we had a few ciders whilst reminiscing about life on the Kiwi bus before attempting to get a few hours shut-eye; Aaron and I sharing a bed in the spare room and the second hand of the clock on the wall taunting us with every tick-tock. Nothing but the two beams from the headlights illuminated our way as we whistled along the tree-lined single-lane roads of Gloucestershire’s backcountry, Aaron crushing a can of Red Bull behind the wheel, the digital dashboard clock reading 01:30, Lady Gaga spluttering through the radio static, and George asleep in the back as I rode shotgun. Greg, the d’Artagnan to our Three Musketeers status, had been a ‘softcock’. Instead of wanting to get up early for the drive he had travelled across to Gatwick the evening before and spent the night in an airport-adjoining hotel; the type of establishment where lonely businessmen get microwaved room service on expenses followed by handjobs from low-self-esteem escorts (or so I’ve heard?). At least he joined in on the round of 4am departure lounge pints after we’d wasted half-an-hour dragging the golf clubs from one end of the airport to the other in an attempt to find the oversized luggage bag drop. Speaking of our bags, George had been so concerned by our 20kg weight limit that he’d taken a set of bathroom scales out to the car with him so as to weigh the clubs once they’d been packed in their protective cases. His concerns about our breaching of the weight limit turned out to be unjustified, however, when the airport employee didn’t even bat an eyelid as she sent them along the conveyor belt. You’d have thought we were boarding the Apollo Space Shuttle as opposed to an Easyjet flight by the way his brow furrowed at the issue. A few other lads were getting the same flight as us – Gerry, John Moore and Talbot – and we were to be sharing a shuttle to the resort with a bunch of guys from Bristol whose flight landed a short time after ours. The thirteen of us then had a practice round booked on the Faldo course for that afternoon before the eleven remaining participants arrived in the evening. I necked a double espresso during the wait – or a ‘beaker’ as I was so informed they call it in Portugal – and then washed it down with a cider before boarding the transfer bus. This set me up in high energy and spirits, but when we hit a standstill motorway traffic jam it also had the unfortunate side effect of making me almost piss my pants. Only after and extreme amount of leg crossing and gentle coaxing of our driver, who found the incident far-too-funny, did he eventually agree to pull over and let me relieve myself in a roadside bush. What a great way to introduce myself to the lads. And as much as I respect and admire Nick Faldo as a figurehead of the British golfing landscape, I can’t say the same for the way in which he designs a golf course. On some of the par 4s I was having to take mid-irons off the tee just to avoid hazards, only to leave myself even longer approach shots in for my second than my first. At least the company was a pleasure. Following a relaxed dinner that evening of a chicken baguette wrap and chips, what would become my staple diet for the entirety of the competition, Garret and Bentley arose from the head of the table to announce the pairings for the day one foursomes. We now had a full-house and the meal had been spent shaking hands and making introductions with the rest of the lads. I found myself being drawn in the second pairing alongside Morray, a fellow Scot and the current world number 1 – Yes, that’s right, there’s even a World Ranking system going on. I was itching to get one over on the English, especially considering their recent dominance of the event. I’ve come to realise that I have a deep passion for watching England lose as sport, regardless of what it is. It’s their arrogance and lack of self-deprecation I can’t stand. Take cricket as an example. I have about as much interest in that sport as I do in television talent shows, but when I recently found out that Scotland were on the brink of a historic victory over the auld enemy from south of Hadrian’s Wall in a one day test I found myself absolutely rapt. Everything was tee’d up for it to be a cracking long weekend.